The bond between a man and his horse has been a fascination of cinema from the days of Tom Nix to those of “Seabiscuit”. Typically, it’s a way to show the tender side of masculinity without forcing your macho leading man to actually shed any tears. This dynamic is emblemized in “The Mustang”, a stirring social drama that examines a program matching violent offenders behind bars with wild horses in need of domestication. If you are prone to crying at movies about horses, bring a whole box of tissues. The powerful, wordless opening scenes show a herd of mustangs being rounded up by a government helicopter and shepherded into a truck. A close-up on one horse’s face cuts to a similar shot of Roman (Matthias Schoenaerts), a burly convict who has recently been reintegrated into the general prison population after a long stint in solitary confinement for a violent outburst. In these early, swift directorial strokes, the film establishes a resounding link between man and animal: both are wild creatures locked into cages, in need of rehabilitation, and clearly of each other. 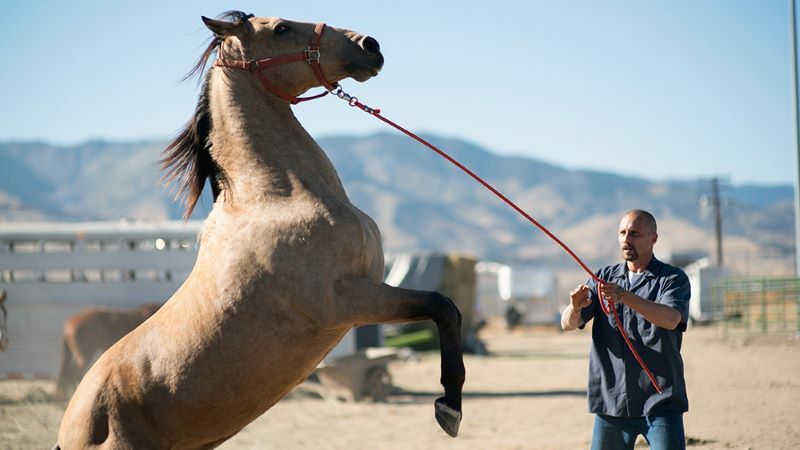 After being caught lingering near the horses by the program’s director Myles (a surlier-than-ever Bruce Dern), Roman is given the chance to work with the wildest horse. He names it Marcus (after mispronouncing the name “Marquis” in an equestrian magazine). Their bond is not instantaneous. Marcus has no feel for the human touch; Roman quickly loses his patience and resorts to violence. But after being given a second chance by Myles, and with the guidance of a more seasoned inmate trainer (Jason Mitchell), man and beast eventually learn to trust each other. It’s an assured directorial feature debut from French actress Laure de Clermont-Tennerre, who also co-wrote the screenplay. Her story is more powerful for its simplicity, and, while her style is far from flashy, she has a flair for knowing where to put the camera. The exterior shots often capture the snow-capped mountains that surround this northern Nevada prison, evoking both beauty and incarceration in the natural setting that enhances the story’s themes. Even when the events onscreen are painful, “The Mustang” is always beautiful to watch. The other place the director most often puts her camera is on the expressive face of her leading man. Schoenaerts, who has catapulted between American and European filmmaking in his impressive career, gives a deceptively complex and powerful performance. Physically hulking and emotionally restrained at the start, his feelings soon come tumbling out of him. The horse brings out his anger, and visits from his pregnant teen-age daughter (Gideon Adlon), who is seeking her emancipation so she can sell the family home, soon bring out his vulnerability. Featuring a human protagonist that most of us would never wish to encounter and an animal the government is trying to extinguish, “The Mustang” is a tremendous work of empathy that only falters in the one place that most films about the man-animal connection do: challenging the anthropocentric paradigm. Despite the overtures of correlation between Ronan and Marcus, the film never asks the tougher questions about what the latter deserves. The story concludes with an auction in which the now-tamed horses are sold to police departments and border control units. Is that Marcus’s best life? Or is it another kind of prison compared to being free on the plains? It’s challenging to tell a horse’s story without access to their inner experience, but since “The Mustang” so clearly establishes a link between its man and its animal, it should have the guts to follow its logic to the end. Instead, we will settle for its well-drawn story, compelling lead performance, and resonant depiction of a man trying to free himself from prisons both inside and out.